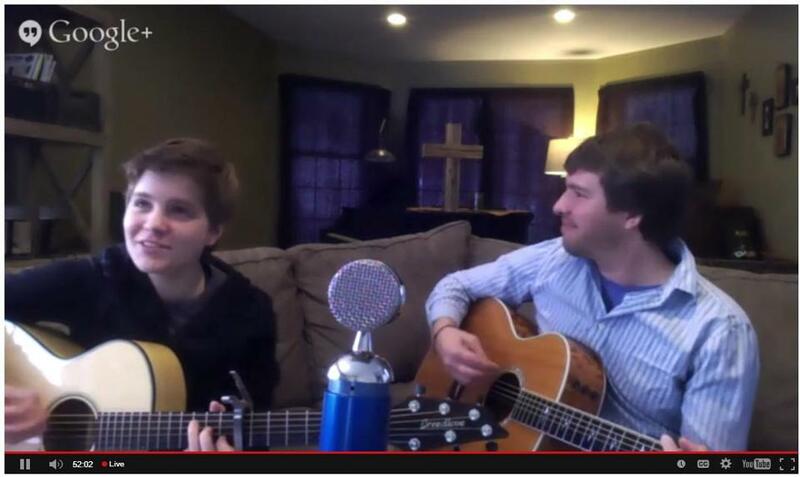 About 500 people watched Mark Huber and his wife, Sarah, in their live Web broadcast of “Couch Church” from Marshfield. No act of God would deter them from Sunday worship. Sunday’s blizzard seemed designed to test even the most dedicated churchgoers, but across the region, churches drew on a reservoir of Yankee ingenuity to adapt to the weather and connect with their congregations. Many churches simply declared a snow day, leaving would-be attendees to trudge home through the deepening snow. But others came up with innovative alternatives: a Marshfield church live-streamed a service from a living room couch; some churches held Sunday services a day early; a Jamaica Plain church conducted prayers of the people via Facebook; and others e-mailed hymns and readings ahead of time so people could conduct their own services at home. Other churches refused to yield to the storm and opened their doors as usual, even if for just a few hardy souls. Some churches experimented with technology. Mark Huber and his wife, Sarah, pastor and creative director of a Lutheran and Methodist church called Sanctuary in Marshfield, decided to stream a service live from their living room. Accompanied by guitars and their dog, Graham, they spoke and sang to their congregation. Huber said he wasn’t sure how it would feel to conduct a service over the Internet; he worried that it might feel a little empty, like staring at a computer screen. But shortly after the service began, he looked down and saw that he had received more than 50 text messages. The community of nearly 500 watching the “Couch Church” began posting prayers on a Facebook page and sharing photos of themselves in attendance — at home with their dogs or sipping coffee. “In some ways we talked more together today than we might have if we were running in and had to get to the grocery store,” Huber said. Judy Noyes and her family tuned in wearing their pajamas, bundled under blankets on the couch and sipping coffee. Others tried what Everett called “preponing” services rather than postponing them. 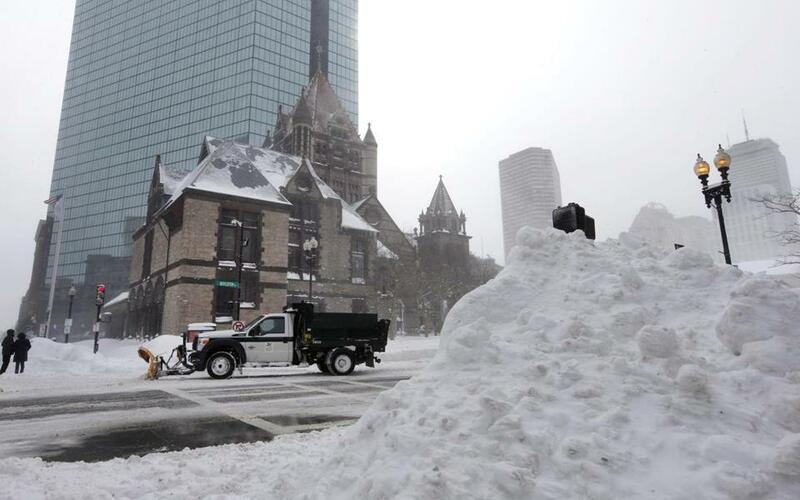 In an example of “preponing” instead of postponing services, Trinity Church in Copley Square held services Saturday afternoon so that the church could stay closed Sunday. At Trinity Church in Copley Square, the storm fell on a “major Sunday” that included a special guest preacher, three baptisms, and a full choir, said Rev. Patrick C. Ward, associate rector for worship. The Episcopalian church was able to coordinate the schedules of out-of-town relatives visiting for the baptisms, the guest preacher, and dozens of choir members to shift the entire service to 4 p.m. on Saturday and close the church Sunday. “It’s highly unusual; there’s probably a handful of times in living memory we’ve closed the church on a Sunday,” Ward said. But the sense of community on Saturday was overwhelming, he said, with people coming to church when flakes had already started falling and lingering for coffee, tea, and Valentine’s Day cake. At the end of the service, the flower arrangements were taken from the church and divided up to be handed out as Valentine’s bouquets, since they wouldn’t be needed on Sunday. Several churches also crafted resources for people to conduct private services. Trinity sent out an e-mail called “Trinity’s Weekend Worship: Blizzard Edition” with links to video of the choir rehearsing, a priest giving a spiritual reflection, Bible readings, and snow day activities for children. Meanwhile, others kept their doors open through wind and swirling snow. The Rev. Timothy Crellin, vicar of St. Stephen’s Episcopal Church in the South End, walked 3 miles to hold services for 10 people. Afterward, the small congregation went out in the snow to burn the palms to create ashes for the beginning of Lent this week. In Belmont, at St. Luke’s and St. Joseph parishes, the 4 p.m. Mass on Saturday was standing-room only. Sunday morning, on the other hand, a half-dozen people came to the 7:30 a.m. service, another half-dozen to the 8:30 a.m., and 10 to the 10 a.m. service, according to Rachel Keeler, associate minister. Hope Central Church in Jamaica Plain closed Sunday, but the text of the service was sent out by e-mail. At 10:30 a.m., members of the church logged on to Facebook to share their prayers. With people feeling frustrated by endless snow, Hope Central pastor Laura Ruth Jarrett said scripture might be a helpful guide. On March 15, this year's snowfall broke the record-setting total from 1995-1996. Data through Mar. 23, 2015 at 11 a.m.